Example of social network mapping from client project*. As I discussed in my last post, we need to understand the current organization before we can design a new one. And we can’t rely on the existing organization chart for this. 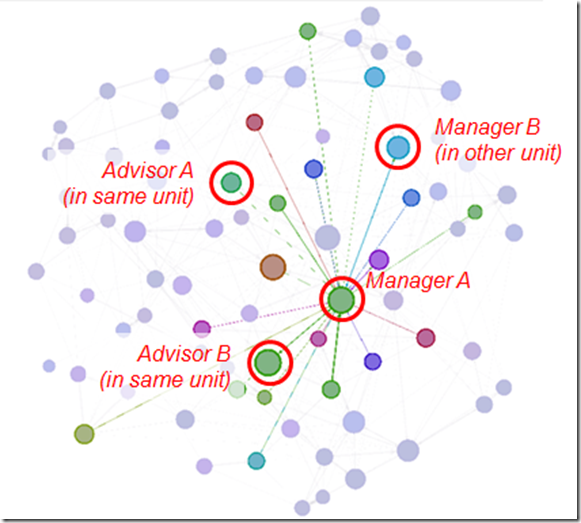 We certainly need to know the existing units and reporting relationships, but there are many other elements of an organization that the organization chart does not reveal. In particular, we need data about the interfaces between different roles and units in the organization. Who is dependent upon whom to reach their key goals? Who delivers something to whom? This information is usually not recorded anywhere, so it needs to be collected somehow. I have experimented with a couple of different approaches. One is social network mapping. Now “social networks” can mean several things. In some academic research, one has focused on informal relationships. So one has sent out surveys to employees and asked them to indicate who they prefer to socialize with or share information with. 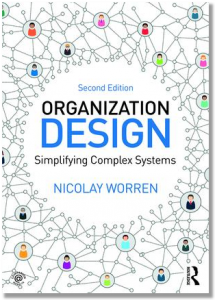 But when it comes to organization design, the most relationships are task-related – that is, relationships that emerge because people work on the same business process or activity, or participate in the same project. So we are talking about using the same methodology – but for a slightly different purpose. The first time I tried this approach, I used my consultant colleauges as guinea pigs. I created an electronic survey with a list of all employees, and asked my colleagues to fill in a questionnaire and indicate who they interacted with most frequently. I then used an analysis tool to create a diagram that showed all the relationships. But all I got was a “spaghetti” of links. There were some clusters – that is, I could see that there were groups of people who were strongly interconnected. But it was hard to say what a given cluster represented: Was it project-related? Or did the cluster only show that a group of people interacted, because they were members of the planning committee for the summar party? So I learned that one had to do this in a different way to get useful and usable data. I have tried to tweak the methodology into something that can work (a colleague of mine in Deloitte, Subhan Shafiq has contributed strongly to this, and so has Tor Kielland in BrightArch, a software firm that we work with). The most important thing we did was to add some additional questions in the survey that we distribute. We ask people to indicate which specific work processes they work on, how much time they spend on each process, and the reason they are in contact with each other. With this additional information, we can put toghether the pieces more easily. This type of analysis can help us build a pretty deep understanding of the current organization. It can also help us identify improvement areas. We can evaluate the “collaboration load” (the number of people a specific person has linkages to) and consider whether individuals have a fairly equal load, or whether some individuals are overloaded (for example, as a result of having a number of direct reports or because of involvement in a lot of projects or initiatives). We can filter the data by process/activity and get a sense of which units/roles contribute to which process. If we ask people whether a person delivers or receives something in the work process, we can also see the direction of the flow. We can isolate the processes that are the most “coordination intensive” (i.e., require most cross-unit collaboration). Perhaps most importantly, we can use these data to evaluate the current formal structure in relation to how work is actually performed in the organization. As one example, we sometimes find that a group of people in one unit collaborates more frequently with people in another department than with colleagues in their own department. This may be a sign that roles should be regrouped. In sum, social network mapping provides a lot of data that can form the basis for a whole range of analyses. Even though it’s a well established methodology for academic research, I would say, though, that it is still new and experimental when it comes to the purpose I describe here. There are still elements that need to be developed further before we have a well tested methodology and clear guidelines for interpretation of the data. But it is an approach that has great potential. It dramatically improves how we visualize the current organization and provides a foundation for making facts-based decisions about organizational changes. *Explanation to the image: The circles represent individuals (the original chart included names for each circle). The distance between two circles represent the frequency of interaction. The colors represent department affiliation. The size of the circles represents the number of incoming linkages to that individual (a larger circle = more people interact with this individual). A dotted line represent a weaker relationship than a solid line. Thanks for your (as always) insightful blog post, Nicolay. Indeed, there is a lack of established methodology for unlocking the potential “magic x-ray” of social network analysis for organizational analysis. I believe the potential to build actionable insights (e.g. for reorganization purposes) is large, and there is certainly no lack of mathematical research or analysis software to support the development of such methods. While there is certainly already valuable insights to be gathered from mapping organizational networks, I do hope that we will see more community contributions (like this) and research on how to apply these powerful tools in our real world business situations.